Most of the bread I bake follows a fairly standard pattern. I’ve got a couple of staple recipes, one for an everyday loaf that works well for white or whole grain and any variation in between and a couple of ways with sourdough, too. The everyday loaf is the most versatile, and it can easily and quickly become a pizza base, a foccacia, a ciabatta or anything of that ilk. It’s good to have a recipe like that in the bag, something that you know and understand well, to the point when you can just make it without thinking. That’s what makes you a baker and not just somebody who makes bread every now and again, that moment when you tip over from just following a recipe to making a loaf by feel and touch. There’s always something else, though. This is an Italian loaf characteristic of the area around Lake Como. It has a wide, open texture in common with many other Italian breads, and a developed, subtle flavour. The structure comes from the fact that the dough is very wet, and quite sticky and difficult to handle – it’s the water that causes the open texture, and it’s worth persevering and working carefully with the dough to get it right. The spring in the oven, the amount that the dough bounces into life when it hits the fierce heat, is quite exceptional in this loaf. There are two stages in making Como bread – a pre-ferment and a bulk fermentation. Essentially, that means that a small amount of dough is made ahead of time and allowed to develop and mature before being used as the base for the actual loaf. This technique of long, slow fermentation is very successful, and provides a complexity that’s entirely missing from loaves made in one go from start to finish, good as they are. One little trick to catch a small part of this extra flavour is to save a golf ball sized piece of dough every time you bake and keep it in the fridge. The next time, work the old dough into the new, and you’ll add an extra layer of complexity to the new loaf’s flavour. The initial dough is called a biga in Italian. The difference between a biga and a normal sourdough starter is that a biga normally has commercial yeast in it, but the same principles apply when handling the two types of starter. To make the biga, mix together 150g of tepid water, 250g of strong, white flour and 5g of instant yeast to make a rough dough. Knead the dough for a minute or two to bring it together properly, then transfer it into a bowl or some other container and let it rest for an hour before moving it into the fridge. The biga needs at least eight hours to develop, but any longer than about sixteen or so, and it’s probably gone too far. The best approach is to make the biga last thing at night and bake in the morning. To make the bread, mix together 405g of the biga, 400g of tepid water, 12.5g of salt, 10g of instant yeast, and 500g of strong, white flour. To incorporate the biga, add it to the water first and break it up a little with a wooden spoon, so that it softens, then add the other ingredients. As the dough is very wet, kneading by hand isn’t practical. It’s best to use a mixer and a dough hook instead, and the dough will need to be kneaded for at least twelve minutes before the gluten is properly developed. You should be able to break off a piece of dough and stretch it to an almost translucent state before it breaks. If you can’t, knead for another few minutes. The dough needs to ferment next, until it’s doubled in size, which could take up to two and a half hours depending on how warm the environment is. It was very hot today, and my dough raced ahead … if anything, it went a little too quickly, but it’s hard to control the speed of fermentation when the weather is a s good as it has been recently. Just try to find a cool-ish, draught-free spot. When the dough has risen properly, slide it out of its bowl onto a floured surface and cut it into two pieces. Shape each piece into a round by gently cupping your hands underneath the dough and pulling it around, so that the top stretches tight and it resembles a ball. 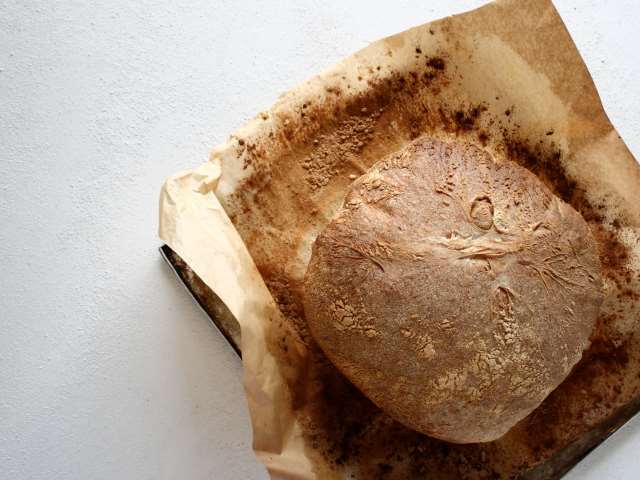 Transfer each dough onto a piece of baking paper that’s been lightly oiled with olive oil and dredged with flour. There’s a slight complication here – the dough needs to rest seam side up, so the tight, domed side should face down. This is unusual, but it’s the way these loaves are made, and I’m not going to mess with centuries of Italian tradition. Dust the loaves with flour, cover them loosely with clingfilm and let the dough prove for about an hour, maybe longer, until it’s doubled in size. Heat the oven to about 225c or higher with a couple of heavy baking trays inside. Moving the loaves from the work surface to the oven is a challenge, but one that’s made easier if you have a pizza peel available, but if not, just gently slide the loaves, still on their baking paper mats, straight onto the hot trays, and put them straight into the oven with a small oven proof tray of water at the bottom to create some steam. Bake for thirty minutes, or until the loaves are baked through and the crust is golden brown. 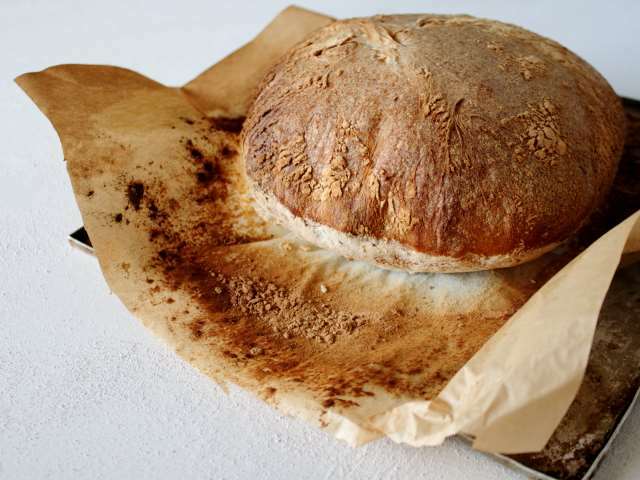 The seam will expand and tear, leaving a distinctive charred scar on the top of the loaf. by Daniel Leader, which is a superb place to start if you’re interested in traditional European baking. 405g of biga? Or 45g? … 405g … it’s a big chunk of biga, about half the weight of the finished loaf. Pretty sure these wouldn’t last longer than 2 days anyway! Thanks for this – going to enjoy making it!